Growing acceptance of evidence-based complementary and alternative therapies has been a catalyst for integrating yoga and meditation with traditional anxiety treatment. Anxiety disorders are the most common mental health conditions in the United States, affecting about 18% of adults and 25% of children and adolescents, according to the National Institute of Mental Health. Complementary and alternative treatments for anxiety are increasingly popular because of growing interest in holistic health and dissatisfaction with pharmacological treatments. Yoga and meditation currently are being used in individual and group sessions to enhance conventional anxiety treatments. “Yoga engages the relaxation response, so needed by those with anxiety, an experience that includes racing thoughts and shallow breathing,” says Mary NurrieStearns, LCSW, E-RYT 500, a psychotherapist, yoga teacher, and coauthor of Yoga for Anxiety: Meditations and Practices for Calming the Body and Mind and Yoga for Emotional Trauma: Meditations and Practices for Healing Pain and Suffering. The easiest way to integrate yoga with conventional anxiety treatments is to refer clients to gentle, restorative, or beginning yoga classes in their community or specially trained yoga therapists. “Gentle yoga is an enjoyable, feel-good practice that focuses on health and well-being. It quiets the mind and relaxes the body by linking physical movement to the rhythm of breathing,” NurrieStearns says. Forbes founded Integrative Yoga Therapeutics, a system for the therapeutic application of yoga for anxiety, insomnia, depression, immune disorders, chronic pain, and physical injuries. She is director of the New England School for Integrative Yoga Therapeutics, which trains mental health professionals and yoga instructors to teach from a therapeutic perspective. This organization was the first yoga program to be approved by NASW and the American Psychological Association as postgraduate continuing education for social workers and psychologists, respectively. She offers the example of a client named Jessie who had a long history of panic attacks and was treated with psychotherapy for seven years. Jessie understood her anxiety triggers and had several techniques to manage negative and anxious thoughts. However, she described herself as “at the mercy of her anxiety,” so she came to Forbes to alleviate the debilitating periods of anxiety she still experienced and to see whether yoga therapy could help her discontinue antianxiety medication. Forbes started her sessions with Jessie with therapeutic sun salutations, a series of physical yoga poses linked with breath. “These are especially grounding for people with anxiety. We finished each session with breathwork and restorative poses,” Forbes explains. Jessie eventually progressed from being unable to sit still for longer than five minutes to being able to hold longer restorative poses. “Her mind began to slow down, and she developed more confidence in her emotional resilience and her ability to handle challenging situations and manage her anxiety,” Forbes notes. Though yoga is most commonly equated with a series of poses performed on a mat, its benefits in relation to anxiety can be achieved through yogic breathing, or pranayama, which is Sanskrit for “extension of the breath or life force.” Pranayama involves techniques that regulate breathing for improved well-being, developed centuries ago by yogis. “One of the key yogic techniques used to counter anxiety is to focus on the breath,” McCall says. Anxiety is mediated through the autonomic nervous system, which involves sympathetic (fight or flight) and parasympathetic (rest and relaxation) responses, according to Forbes. “Lengthening the exhalation relative to the inhalation shifts the body from sympathetic to parasympathetic dominance and is very useful in countering the hyperarousal that typically accompanies anxiety,” McCall explains. This deep breathing with longer exhalations helps slow heart rate and respiration, thereby calming anxiety by acting like a “dimmer switch” to overactivated nervous systems, Forbes explains. Adding meditation can further calm the nervous system by focusing attention on the present moment and away from anxious thoughts, she says. Those who practice yoga poses likely are familiar with some yogic breathing, but pranayama can be performed by itself and with meditation. 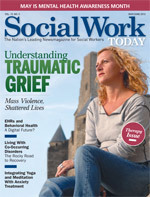 Most social workers do not have the yoga training to teach physical poses for anxiety relief, but yogic breathing and meditation techniques can be learned and more easily applied in the traditional therapeutic setting. Amy Weintraub, MFA, E-RYT 500, author of Yoga Skills for Therapists: Effective Practices for Mood Management, created the LifeForce Yoga Practitioner Training for Depression and Anxiety, which teaches evidence-based yogic principles supported by psychoneurobiologic theory that can be applied in the clinical setting without a yoga mat. LifeForce Yoga training, which has been implemented by many social workers in therapeutic settings, provides clinicians with simple yoga-based breathing exercises, meditations, and hand gestures (mudras) for inducing calm. LifeForce Yoga does not require any knowledge of yoga poses or physical alignment; the yoga principles applied are ancient and predate the more well-known poses, such as downward-facing dog, practiced in yoga classes, Weintraub says. For centuries, yogis used breathing, mudras, and meditations to balance the body and mind. Weintraub notes in her book that these yogic principles complement the ultimate goals of psychotherapy, including self-awareness, self-regulation, self-acceptance, and a client’s individual emotional goals. “Ancient yogic practices are now evidence-based strategies for mood management,” she says. For example, a therapist may begin a session with an anxious client by guiding him or her to practice a calming mudra (e.g., hands cradled in lap) with slow breathing, where the exhale gradually is lengthened. Breathing and meditation help clients focus, allowing them to access their emotional state and better prepare for therapy work, Weintraub says. “Often, individuals with anxiety will arrive to a therapy session all ‘revved up.’ Yogic breathing and mudras at the beginning of the session calm the anxious client,” she notes. These yogic techniques also give clients a “window through their anxiety” and help combat negative self-talk, Weintraub adds. Integrating yogic strategies into therapy sessions not only helps the client but also may help clinicians with self-care, she says, since they often perform the breathing and mudras along with the client. Clinicians should be aware that integrating breathwork in therapy sessions can result in what Weintraub calls “emotional flooding” for the client. “Shorter, more rapid upper-chest breathing is very common in anxiety, and when deeper breathing is performed, emotions can be released,” she explains. While this emotional breakthrough can facilitate therapy progress, it can be stressful for both client and therapist. In LifeForce Yoga Training and in her book, Weintraub describes how therapists can ease into breathing exercises to balance and guide therapy appropriately using certain breath techniques that “meet the mood” and reduce the risk of emotional flooding. While stationary yogic breathing and meditation do provide therapeutic benefit, some individuals may derive more benefit by adding a physical yoga practice. Some yoga poses are specifically geared toward anxiety relief, including forward folds, some twists, legs-up-the-wall, and supported restorative poses. — Jennifer Van Pelt, MA, is a freelance writer based in Reading, PA, a certified yoga instructor, and a frequent contributor to Social Work Today. Like yoga, Reiki usually is performed in conjunction with meditation and may be of interest to some social workers. According to the National Center for Complementary and Alternative Medicine, Reiki is a complementary health practice that may facilitate an individual’s own healing response. Despite a lack of high-quality evidence, Reiki currently is used to treat various medical conditions, including cancer and fibromyalgia, as well as anxiety and depression. “Reiki seems to be more accepted by clients as having therapeutic benefit since I am a licensed social worker,” says Mitzi Z. Wood, MSW, LCSW, who has 15 years of experience as a Reiki master and meditation teacher. Reiki can be administered alone or in conjunction with traditional talk therapy to help clients with anxiety, she says. Wood says shifting language can make Reiki and meditation more acceptable to skeptical clients. For example, when Reiki and meditation are practiced in the context of a stress management or relaxation session for anxiety, alternative medicine becomes more appealing to traditionalists, she says. First building the therapeutic relationship over several sessions and understanding the client’s anxiety issues before suggesting Reiki also can lessen skepticism. “Anxious clients often cannot calm their minds by themselves, and until they can relax and be calm, there can be no therapeutic progress. Reiki given in the beginning of a session, often along with meditation and breathing, has helped clients that have been anxious their entire lives,” Wood says. After the client experiences calm, they are better able to find that state again themselves, she adds. Meditation and yogic breathing are tools that clients can use at home to build on progress in therapy sessions. Reiki is gaining acceptance in the medical and social services community mainly due to anecdotally reported positive experiences and results from Reiki sessions. Wood says learning Reiki could be a continuing education opportunity for social workers and could help enhance the therapeutic relationship with clients. “When social workers learn and integrate Reiki into therapy, they can treat the whole client: body, mind, and spirit,” Wood says.